Analyzing system crashes on non-persistent machines can be a bit tricky. In this article I use a live example to demonstrate how to find the root cause. Recently, I had to analyze an issue in a Citrix Virtual Apps and Desktop (CVAD) farm, version 1808, in Azure. Each day, one or more servers (workers) crashed unexpectedly and the cause for this was unknown. You need to be alerted as soon a server crashes in order to secure the dump file. The dump file is required for further analysis. Also, you need to know the computer name of the server that crashed. Once you know which server(s) crashed, you need to secure the dump file (*.DMP). This file contains the information to determine which process or driver caused the crash. On non-persistent machines, the dump file may be lost during reboot so you need to prepare for this. You need a tool to open, read ad interpret the dump file. 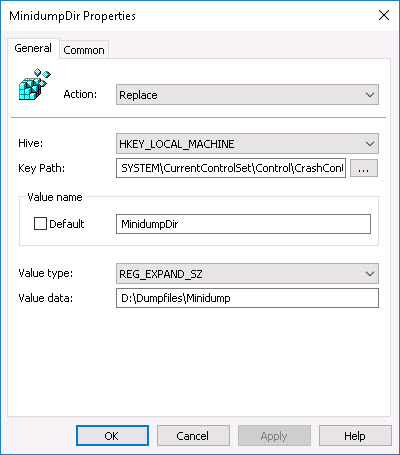 In this article we will use the standard Microsoft tool Windows Debugger (WinDbg). It is imperative that you get notified of any server crashes immediately. First of all. server crashes have a huge negative impact on users, since these users will most likely lose data due to the unexpected reboot that follows right after the server crashes. Even if no data is lost, the experience of your remote session simply being dropped and all your applications being closed is not a pleasant one. 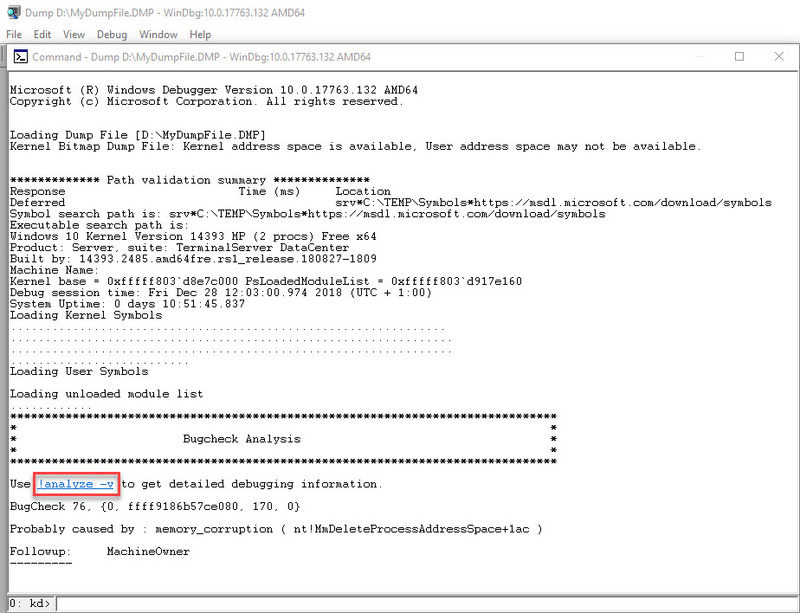 Secondly, you want to secure the dump file (*.DMP) as soon as the server is back online again. The dump file contains a snapshot of the memory that was in use at the time of the crash. You need this file to find the root cause. We will deal with the dump file in the following section. In case you are using third-party monitoring software, this software can notify you as soon as a server is not reachable for a certain amount of time. In case you do not have any monitoring software at your disposal, let me share with you a small script I wrote that monitors the connection to your servers. The script is based on my installation template and my PowerShell Functions Library. In summary, the script pings each worker in an interval of five seconds. Verbose output is written in the console as well as in a separate log file. In case a server is not reachable, an automated e-mail is sent. I recommend that you run this script on a server that does not host user sessions. No Citrix PowerShell modules are required for this script to run. The functions used in the scripts require my PowerShell Functions Library to be present on the local system. This means that before you can use the script, you need to copy the PowerShell module file DS_PowerShell_Function_Library.psm1 to the local system. The script was created for Windows 10 (all versions) and Windows Server 2016 (all versions). I tested this script on Windows Server 2016 version 1607. Create an installation directory on the server where you want to execute the script. For example: C:\Scripts. Download and copy the PowerShell module file DS_PowerShell_Function_Library.psm1 to a directory of your choosing on the server. Copy the PowerShell script below to a new PS1 file (e.g. Citrix_CVAD_Check_Connection_Workers.ps1) and add this file to the directory we created previously. Line 45 (optional): modify the location of the log directory. Line 46: enter the correct path to the PowerShell module file. Line 47: enter the names of the workers you want to monitor. Line 48: enter the e-mail address of the sender. Line 49: enter the e-mail address of the recipient(s). Line 50: enter the subject of the e-mail. Line 51: enter the name of the SMTP server. $To = "firstname.lastname@mycompany.com", "firstname.lastname@mycompany.com" #  Enter one or more e-mail addresses you would like to send the e-mail to. Separate multiple e-mail addresses using a comma, e.g. "<name1>@mycompany.com", "<name2>@mycompany.com"
$Global:LogFile = Join-Path $LogDir "$($ScriptNameShort)_$($DateTime).log"
You find similar output in the log file. If you did not change the default values, the exact path to the log file is: C:\Logs\Citrix_CVAD_Check_Connection_Workers.log. In case of an error, the first character on each line changes from "S" (success) to "E" (error). Also, an e-mail is sent to the administrator(s) in case a server was not reachable. If this happens you want to secure the dump file as soon as possible as described in the following section. In the script (in line 47), the names of the workers are parsed using a simple array. You can of course replace this array with a different method. For example, you can read the server names directly from an OU in Active Directory or you can add the server names to a text file and read the contents of this text file directly in the script. These additional methods exceed the goal of this article. In case you need some help creating the PowerShell code, please contact me directly using the contact form on this website. Now that we know which server(s) crashed, we need to retrieve the dump file (*.DMP). When a Windows system crashes ("blue screen"), a snapshot of the memory that was in use at the time of the crash is stored in a dump file. We need to analyze this memory to find the root cause. 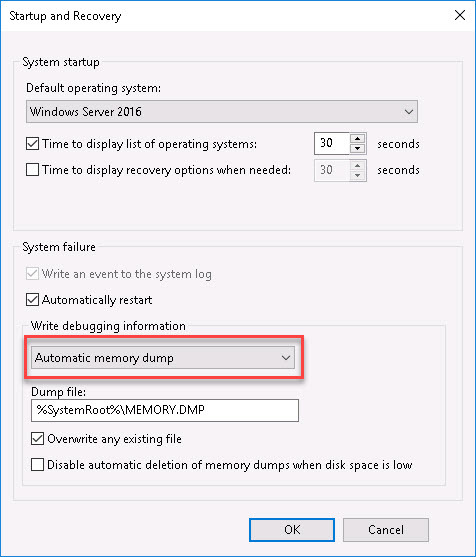 By default in Windows Server 2016, Windows creates an "automatic memory dump", which is a kernel memory dump. For more information on this type of memory dump, please see the Microsoft article Windows 8 and Windows Server 2012: Automatic Memory Dump. 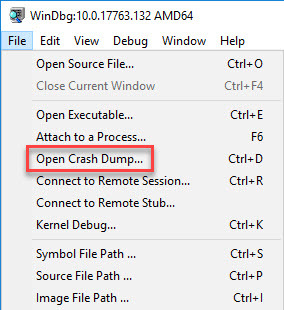 Which type of dump file is created at the time of a crash depends on how you configured your system.The type of memory dump file can be configured under Control Panel \ System \ Advanced system settings \ Advanced (tab) \ Startup and Recovery settings. The size of the dump file depends on a couple of factors, but it can grow quite large (as large as the total available RAM in your system). By default, a system crash is always followed by a system reboot. You can prevent this automatic reboot by clearing the tick box Automatically restart (see previous screenshot). Normally, you do not want to prevent the reboot, because it means that the system is not able to "repair" itself. If an automatic reboot is prevented, the administrator will have to reboot the system manually. On a non-persistent machine, by default, all write IO is temporary. This includes such things as event logs and dump files. As soon as the machine reboots, all newly created files and folders that were created after the machine was last started will be deleted. After a reboot, a non-persistent machine will boot from the clean base image. Therefore, on a non-persistent machine, you want to make some files and folders persistent. You do this by redirecting these files and folders to a locally attached persistent disk. 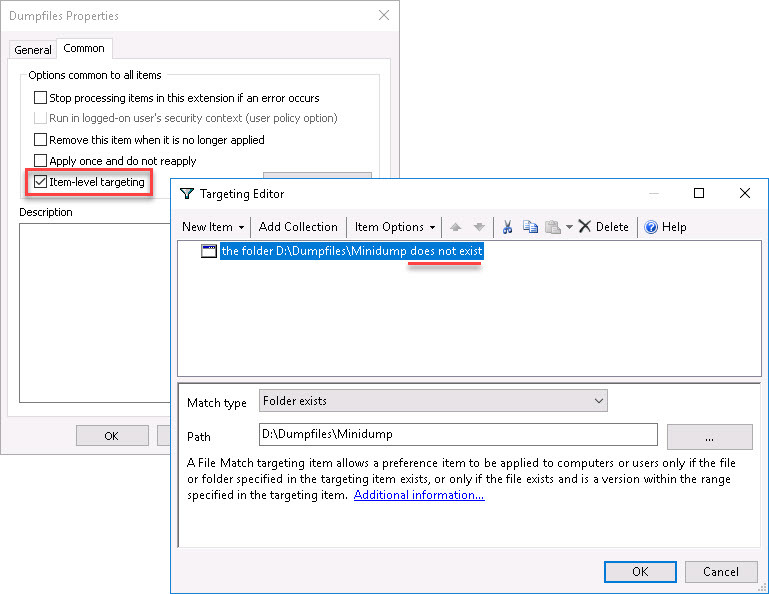 In the following paragraph I will show you how to redirect the dump files to a different location on a persistent drive. 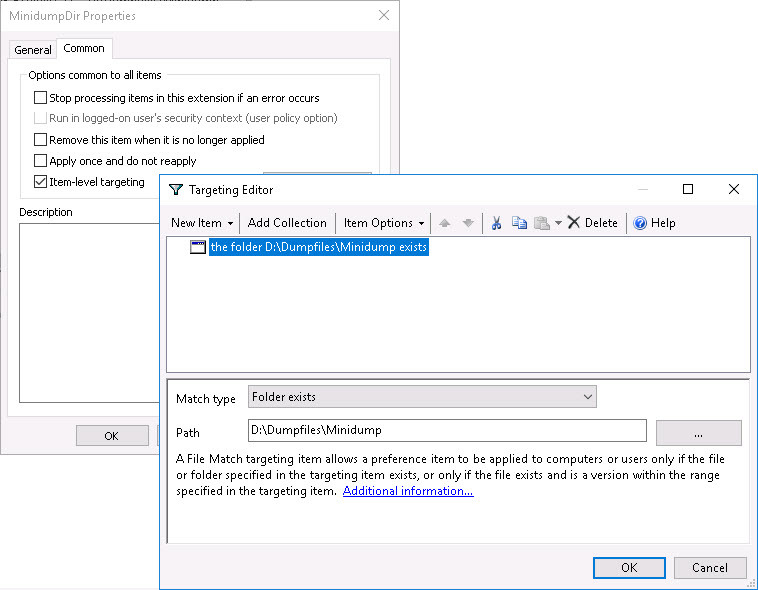 You can do this using Group Policy Preferences (GPP). These locations are defined in the registry key HKLM\SYSTEM\CurrentControlSet\Control\CrashControl. To redirect dump files you first need to create a directory on the persistent drive. In this article I will assume that this is drive D: (but this can be any drive letter of your choosing). We can use a GPP folder item to accomplish this. Enter the full path of the folders you would like to create. 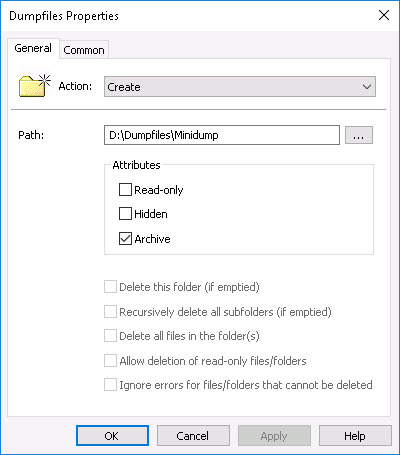 In the example below, the path D:\Dumpfiles\Minidump creates two directories at once: D:\Dumpfiles and D:\Dumpfiles\Minidump. The full dump files will be stored in D:\Dumpfiles and the mini dumps in D:\Dumpfiles\Minidump. I recommend to use Item-Level Targeting (ILT) to run this GPP item only when the folder does not exist. Now that we have created the new location for the dump files, we need to actually redirect the dump files to this new location. We need to create two GPP registry items; one to redirect the full dump files and one for the mini dump files. *Enter the directory of your choosing in the field value data. 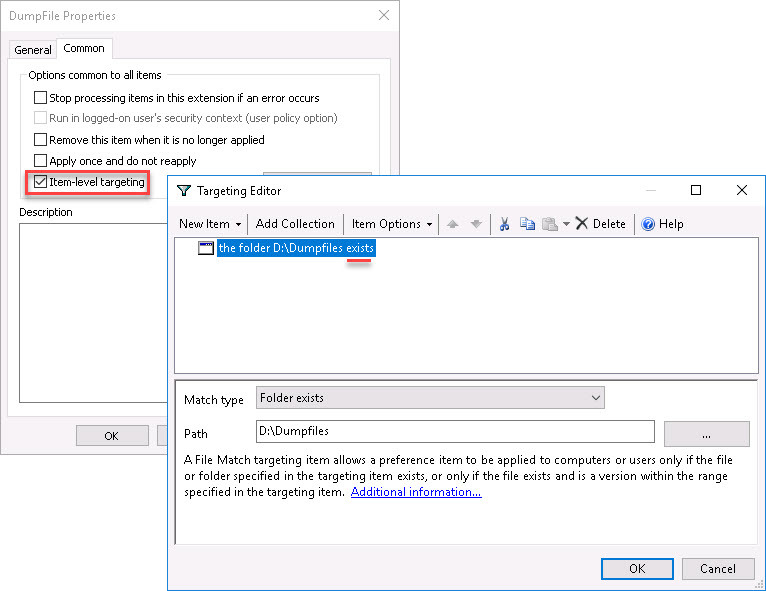 Use ITL to make sure the target directory exists before redirecting the dump file. Now we can create the second GPP registry item to redirect the mini dump file. Use ITL to make sure the target directory exists before redirecting the mini dump file. And now we are done. As soon as the above group policy settings are applied to the servers the (mini) dump files will be redirected to the persistent drive. In the following section I explain how to analyze a dump file and how to find the root cause of the server crashes. In the previous two sections we make sure that we are alerted when a server crashes, that we know the name of the server that crashed and that our dump files are stored persistently (not lost on reboot) so we can use them to analyze the root cause of the server crash. Now it is time to start analyzing a dump file. You do not want to install Windows Debugger on your normal workers that are used by your users. You need an internet connection to download the so-called symbol files. As an administrator, you may not always have an internet connection (read: proxy settings) on a server (worker). You can either download the installer (around 1,5 MB) or the complete ISO file (more than 800 MB). 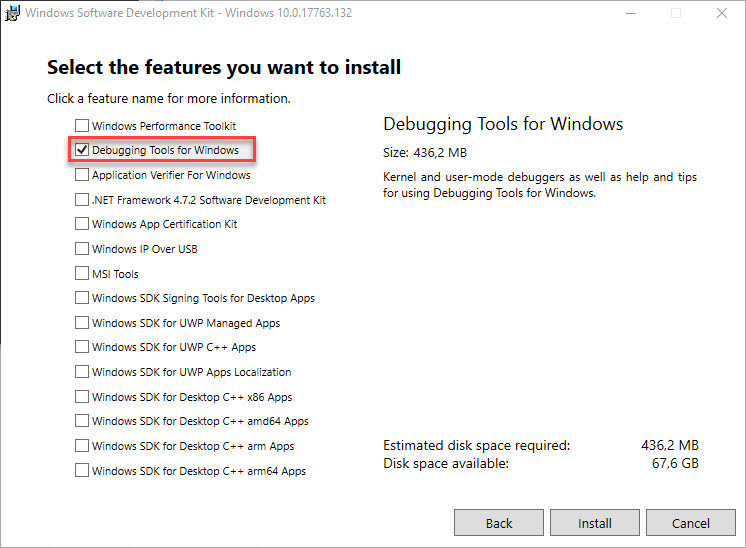 To install the debugging tools (including WinDbg) you only need to select Debugging Tools for Windows (requires about 436 MB). You can deselect all other features. Replace x64 with x86 for the 32-bit version of the debugging tools. The first thing to do after installing and launching WinDbg is to define the path to the symbol files. Symbol files have the extension PDB and contain information that can be helpful when debugging dump files, such as function names and variables. Symbol files help you to better interpret the data displayed in WinDbg. 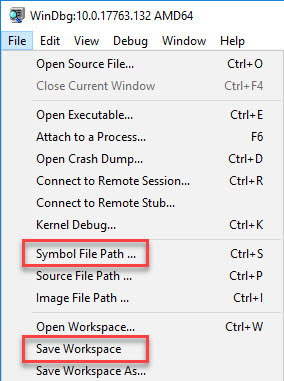 In the menu, go to File, Symbol File Path. The green section, "C:\TEMP\Symbols", represents the local directory where the downloaded symbol files are cached. Make sure to create this directory on your local computer. You can choose your own preferred directory path. I also recommend to save the base workspace (File, Save Workspace). If you do not save the workspace, the symbol search path you entered will be lost as soon as you close the application. You will have to enter the path again next time you use WinDbg. 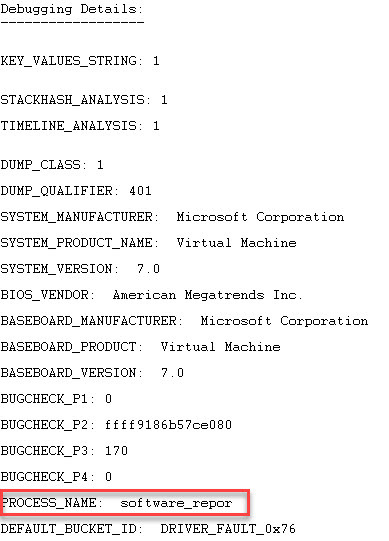 Now that we have prepared WinDbg we can open the dump file and start our analysis. In the menu go to File, Open Crash Dump, select your *.DMP file and open it. 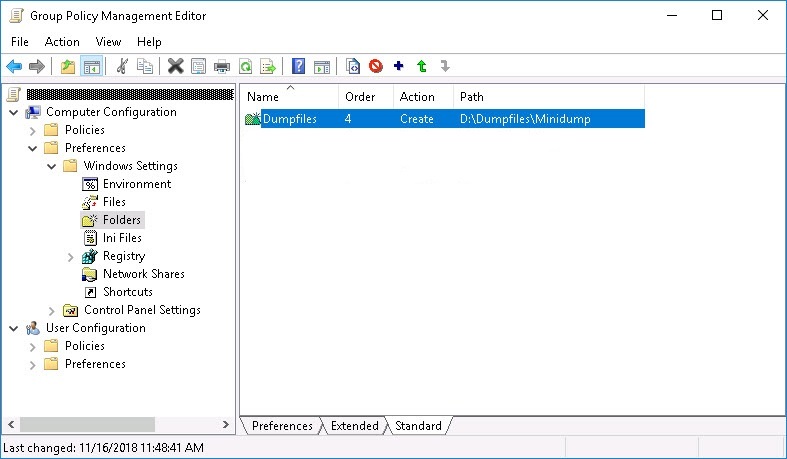 You can choose to open the mini dump file or the larger, standard, dump file. I analyzed the larger one. My dump file was almost 1 GB in size. Now comes the hard part. Dump files are not easy to analyze. I am not going to pretend that I am an expert in analyzing dump files. So far I have always been able to extract the information I need from them and I will share with you what I know. The screenshot below is what you see when you open a crash dump. The last section is a short bug-check analysis and already showed me an important piece of information: BugCheck 76.You can find references to all bug check codes in Microsoft's Bug Check Code Reference. In this case, bug-check 76 relates to a driver that failed to release locked pages after an I/O operation. This was interesting information, but it still did not tell me the root cause of this bug. ...or you can simply click the !Analyze -v link in the section Bugcheck Analysis. Now we will see a lot more detailed information that will (hopefully) help us to find the root cause. Some process of driver is making my servers crash. The most important piece of information that led me to the root cause was the process name. The process name is one of the first things that you should check. The executable mentioned here is most likely the root cause of your system crash. In my case, the process name was not displayed fully. I do not know why; perhaps the maximum length that can be displayed is limited at 14 characters. The full name of the process "software_repor" was "software_report_tool.exe" and is part of Google Chrome's Cleanup Tool. This tool is automatically downloaded by Chrome. Not all users had this file in their AppData\Local folder. On the machine where I was checking non of the users had this tool in their profile yet, so I was not able to find it. In the section Software Reporting Tool in the article Google Chrome on Citrix deep-dive I explain how you can prevent the Software Reporter Tool from running. I hope this article was of some help to you. This entry was posted in CVAD (XenDesktop), Microsoft and tagged Analysis, Azure, crash dump, Troubleshooting by Dennis Span. Bookmark the permalink. You are absolutely right John! Thanks for the feedback. I have corrected the registry entries.